In the nearly year that I’ve spent donning a PlayStation VR Headset, most of the experiences I’ve played through have been of a seated nature. The few that required standing up still felt limited with how much the player can move and interact with the world. Virtual Reality technology still hasn’t progressed to the point where free range of movement can be enjoyed by players that might not have fully grown into their ‘VR legs’. 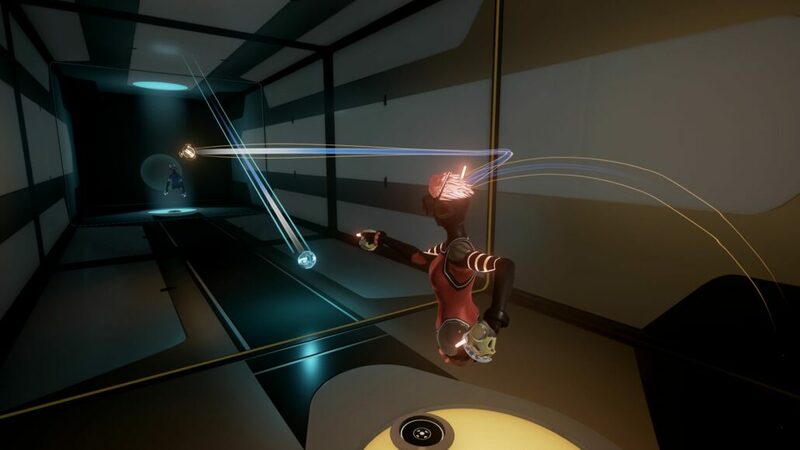 Sparc is one of those rare titles that can introduce players into the realm of PSVR gaming and get them moving without giving off that floaty feeling that other titles have given me even during long stretches of playtime. The premise behind Sparc is incredibly simple: two players stand end to end across an enclosed court and try to throw one of two balls (one matching their color) directly at the opposing player. Think a one-on-one variation on Handball. With a PS Move controller in each hand, Sparc does a great job of mimicking your hand movements and giving the player control on their shots, from the speed and angle to even being able to put a little spin on the toss as well. Evading shots with your body that are still accurate enough to land in the opposing player’s Strike Zone will result in a foul, or Strike, that will give your opponent’s throws a larger diameter projectile and speed until their next point is scored. To protect their goal, players have a couple of options. On a Basic match, players are equipped with knuckle guards that allow them to simply punch the enemy’s ball back across the court. If you want to get a bit more stylish, you can catch your own color ball and while holding it, a shield is produced that can slam an opponent’s ball right back at them. I’ve learned the hard way that only your own color ball can be grabbed, leading to a number of unsatisfying fouls and goals that could’ve otherwise been avoided. Having two balls on the court can lead to some very interesting mechanics. Since you can control the velocity and speed of your throws, I enjoy mixing up my shots by deflecting an opponent’s ball as slowly as possible and try to time a curved fastball to land at just the same time, something novices might not be able to manage simultaneously but instantly gets me blown up online when a pro wises up to my tactics and does the same right back in my virtual face. Rather than running around a court to play Sparc, players remain standing in one spot and can freely lean and swing their arms around within their confined circle. It required a pretty wide area compared to my usual seated experience. Since you won’t have to get up and walk around, it’s important to clear out enough space to lean from side to side and swing your arms around without hitting any furniture or the roommate’s cat. For players like myself that live in an apartment, Sparc requires a fair bit of Feng Shui and life rearrangement to play properly. Beyond the incredible multiplayer, Sparc is a pretty slim offering for those less social gamers. There’s a number of challenges that can test the player’s reflexes and throwing skill, good practice before heading online. I spent my first night knocking all of these out in little more than a couple of hours and had a fairly good grasp on the more advanced techniques such as aiming a ball deflection or curving my shot. At launch, Sparc doesn’t offer any form of AI versus matches, so your only chance at true competition is to take the v-sport online. Online matches for Sparc come in three different flavors. A basic brawl gives players a set number of minutes to score as much as possible, whereas an advanced match only ends once a target score is reached (and even then, it’s best-of-5 games per match). There’s a third mode that mixes up the Basic ruleset with some extra obstacles and walls separating you from the opponent’s goal, so those skills in the offline challenges can really be put to use. One of the absolute best features to Sparc is in its online lobbies. When not taking your skills to the court, players can hang out and watch matches in real time. I was impressed the first time I jumped into a lobby and could lean in and watch a miniature version of the match go on in real time. If CCP can get Sparc to take off as the first ‘V-Sport’, I would love to see matches streamed online in real-time among pros and watch as a ringside spectator. Oh, and talking trash takes on a whole different feeling when you’ve got the opponent staring you down face-to-face despite being somewhere across the globe. Since you and everyone else you’re playing against are wired into their PlayStation VR headsets to enjoy Sparc, movement and hand motions are replicated 1:1 with the PlayStation Move controllers. If you want to be that weird guy that dabs after every point scored, Sparc totally allows that. Sadly, you’re only limited to muting the player and not simply erasing them from the face of the internet if they start pulling that off. 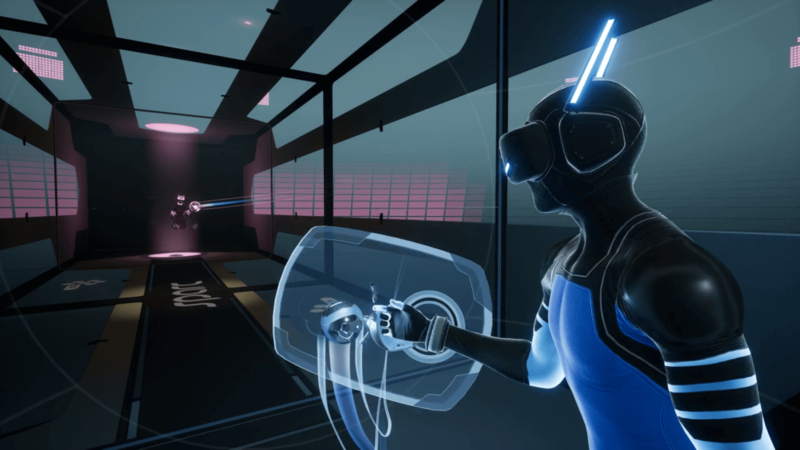 Sparc is one of those rare VR games that I can’t stop thinking about. Every day when I get home, I boot up Sparc and hop online even just for a single match. No matter if I win or lose a match, I’m always itching for just one more game. That’s something I haven’t experienced in a PSVR title since RIGS and since my body is getting up and being active, Sparc is both more comfortable to play for an extended period of time but is also an incredible workout. Most nights I walk away from the headset dripping in sweat like I just spent the last hour doing cardio exercises. 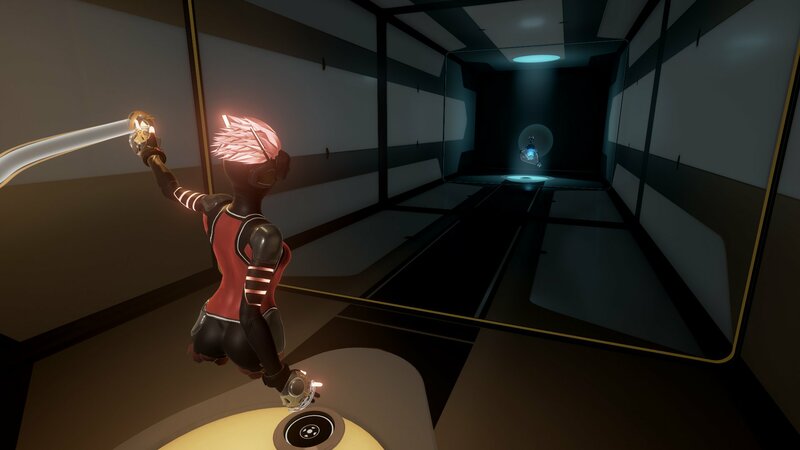 Sparc combines the futuristic sport of Tron's disc battles with handball to create a unique PSVR experience that will have you moving and throwing with the greatest of ease. As a spectator V-sport, the focus on competitive online multiplayer makes up for the sparse amount of single player content.